Carroll is a Catholic, liberal arts college. In order to ensure that each student shares in the wisdom that goes to make up the foundation of such a school, the College requires all students to participate in a broad spectrum of academic disciplines. This range includes those disciplines which help develop the contemporary, enlightened mind, namely, the humanities and fine arts, the social and natural sciences, and the reflective disciplines of philosophy and theology. Upon completion of the Core Curriculum, students will: understand the diversity of the contemporary world; acquire aesthetic, scientific, quantitative, ethical, and religious insights; develop a full range of communication skills; appreciate the interrelationships among branches of knowledge. 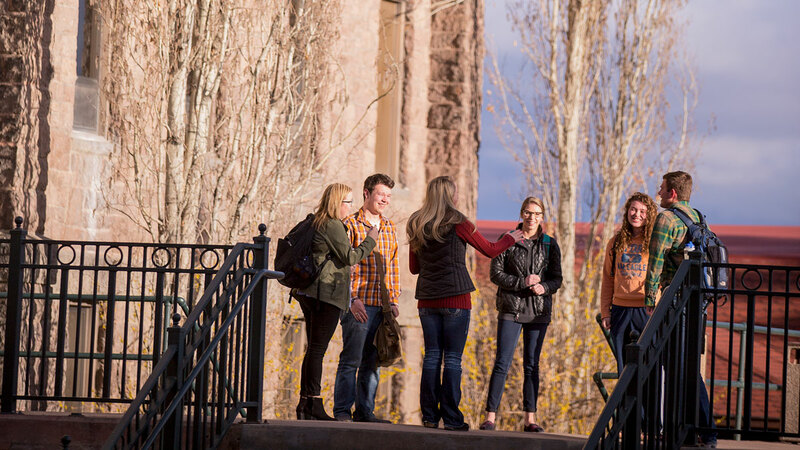 The Carroll College Core Curriculum requirements are applicable to all students receiving the baccalaureate or the associate degree, except in the case of post-baccalaureate students or transfer students with an earned AA or AS degree prior to entry to Carroll. Core requirements may not be fulfilled through elected pass/fail grading. A person who holds a baccalaureate degree from another regionally accredited institution may pursue a second major or degree at Carroll College as a post-baccalaureate student. In this case, all Core Curriculum requirements will be considered fulfilled, except for 3 credits of philosophy and 3 credits of theology. Courses meeting these required philosophy and theology credits may be transferred from a previously attended institution. Expand below for a more detailed explanation of core degree requirements. Each academic program have their own requirements in addition to the core curriculum. You can find a list of academic programs on our academic programs page. The CORE, taken as a unit. 13 credits to be completed within the first 45 semester hours at Carroll College. Note: Foundations classes may not be used to meet other CORE requirements. 2 courses, the two WI courses must be selected from two different disciplines, one in the major and one outside the major. Note: Members of the Honor Scholars Program (HSP) have unique course requirements and fulfill fifteen (15) of their forty-nine (49) Carroll College Core Curriculum (CORE) credits by participating in HSP seminars. The Associate of Arts degree serves the student who does not wish to pursue a four-year baccalaureate program. It is designed to promote cultural growth and acquaintance with the major areas of study and to create a strong foundation in one area. Associate of Arts degrees are available with curricula in business administration, computer science, English, English writing, and communication studies. Note: Both full-time and part-time students must meet the Carroll College Core Curriculum in effect at the time they become degree candidates. All students must elect a standard major or develop a multi-disciplinary major. Ordinarily, students decide on a major by the end of the sophomore year. Students are expected to satisfy the graduation requirements in effect the year of initial enrollment as degree candidates at the College providing they can complete requirements within a continuous six-year period. If graduation requirements change after that date, students have the option of petitioning to satisfying either the requirements in effect at the time of initial enrollment or the requirements of a subsequent catalog. Generally, if a student interrupts attendance, s/he must graduate under the requirements in effect at the time of re-admission; however, a student who takes a one- or two-semester break from the College and leaves in academic good standing may be eligible to return under her or his original catalog year, providing s/he can complete the requirements within six years of initial enrollment. Determination of appropriate catalog years is made by the Registrar. At least half of the credits required in the major field for the associate’s or bachelor’s degrees must be taken at Carroll College. Exceptions require the approval of the major department chairperson and the Associate Vice President for Academic Affairs. Students are not automatically accepted into all major programs of the College. A number of departments require that certain standards be met and that a formal application be filed. See specific requirements as listed in the academic programs of this catalog. To qualify for acceptance into the major department, the student must meet college standards as outlined in this catalog. A specific minor is not required for graduation except in those cases where a student wishes to graduate under certain teaching options for secondary education. Any student may obtain a minor by fulfilling the departmental requirements for the minor as set forth in this catalog. At least one-half of the credits required for a minor must be taken at Carroll College. The purpose of the multi-disciplinary major (MDM) is to permit students in good academic standing to fulfill their personal academic objectives and complete their degree at Carroll College through an integrated program of study that is not possible through an existing major. The program should draw on the curricula of two or more disciplines and create a coherent academic focus. The student who wishes to pursue an MDM will choose a principal advisor and two additional faculty who will work with the stu-dent to plan coursework that will provide breadth and depth in the chosen disciplines. An approved application form must be filed with the Office of the Registrar no later than three semesters prior to graduation. Usually, this deadline will be the end of the student’s fifth semester. Application forms are available at the Office of the Registrar and include a listing of steps to follow in developing a Multi-Disciplinary Major. The student must be in good academic standing prior to submission of the proposal. At least 18 semester hours must be taken within the sponsoring discipline. The student may not be required to take more than 24 semester hours within the sponsoring department. At least 12 semester hours must be taken in a second discipline. MDM must include a minimum of 48 semester hours that include courses from the sponsoring discipline and other courses deemed to be relevant by the students and the MDM committee. The list of required courses must contain a minimum of 24 semester hours at the 300/400 level. At least one-half of the credits required in the MDM proposal must be taken at Carroll College. The regulations governing the honors thesis and the comprehensive examination of the sponsoring discipline will apply. An approved application form must be filed with the Office of the Registrar no later than the fall semester prior to graduation. Usually, this deadline will be before the end of the student’s third semester. Application forms are available at the Office of the Registrar and include a listing of steps to follow in developing a Multi-Disciplinary Major. At least 12 semester hours must be taken within the sponsoring discipline. The student may not be required to take more than 16 semester hours within the sponsoring department. At least 8 semester hours must be taken in a second discipline. An MDM must include a minimum of 24 semester hours that include courses from the sponsoring discipline and other courses deemed to be relevant by the students and the MDM committee. Of the final 45 credit hours earned toward the degree a minimum of 30 credit hours must be earned at Carroll College with at least one-half of the credits required in the MDM major taken at Carroll. See the full list of courses that have been approved to fulfull Writing Intensive (WI), Global Diversity (GD), and National Diversity (ND) core class requirements.